Our goal at EVMS is to create learning experiences that engage learners so that they invest themselves in study, summary, paraphrasing, outlining, note taking, practice, listening, discussion, debate, argument, theorizing, discovery, and fruitful experience. At the end of the day, learning is something the learner must do. Getting all of our students to engage and actively grapple with the topic at hand is difficult, especially in those situations where there may be over 200 students in a class. 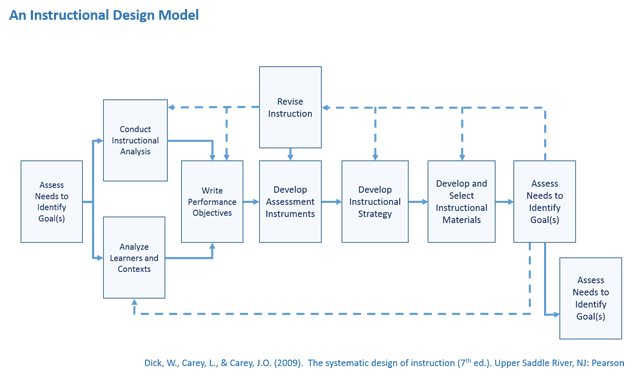 In the instructional systems model, the defined outcomes--the objectives--are clearly articulated at the beginning of the design process. These objectives can then be put together to make up the test for this training. This test is developed prior to designing the instruction. Then, all of the subsequent design and development is aimed at teaching learners the knowledge and skills they need to do well on the test. In a very real sense, we are training students to the test. The key to this working is that the test must be a valid and reliable measure of the skills and knowledge that is really needed.